(We’ve been on a break for the last 15 years). If you’ve been trawling Google for activities that will leave any resemblance of adulthood in the dust, you’ve come to the right place, friend. 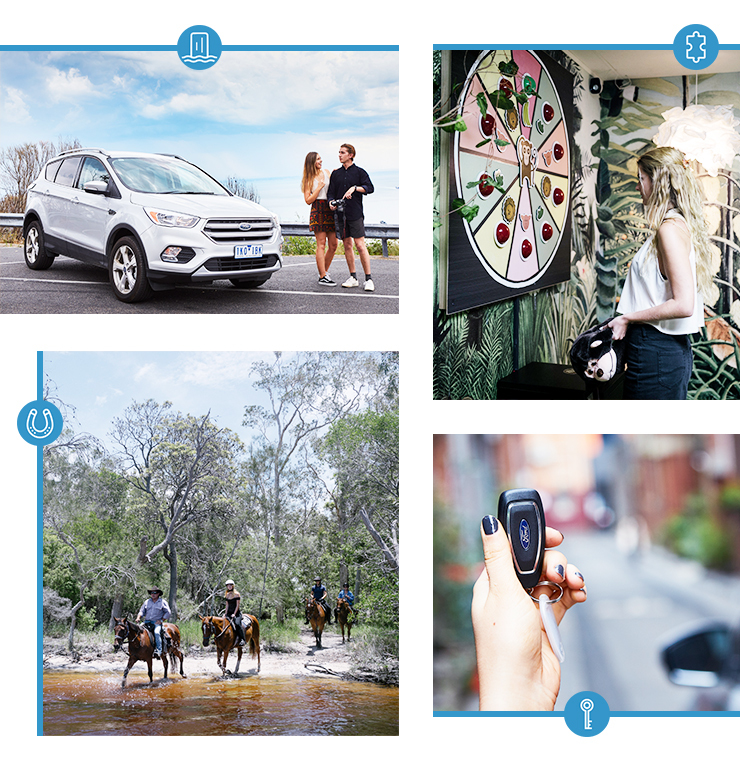 We teamed up with Ford to bring you all the activities to do this weekend if you’re basically just a giant kid (their Ford Escape makes a pretty good non-imaginary bestie). And like an unsupervised two-year-old in a candy store, once you get started on this list, you’ll never want to stop. Australia is pretty far away from the most magical place on earth (aka Walt Disney World), but we’re lucky the Gold Coast has some of Australia’s best theme parks on its doorstep. From Movie World and Wet n Wild to Dreamworld and Seaworld, there’s something to keep anyone’s inner kid happy. If you haven’t checked out the Currumbin Valley rock pools yet, you better hop to it because we’re told the drive alone is worth the trip. Relive your childhood days of swinging on ropes and jumping into the icy cool pool below. Don’t forget to pack a picnic! There’s two words you never thought you’d see together. If you’re not too keen to do the real thing (and we don’t blame you) iFly is the place to go for some awesome indoor skydiving action. Step into their wind tunnel and let your instructor whizz you around until your cheeks puff up just like the real deal. On a tour with Gold Coast Island Buggy Tours. The half day action-packed adventure includes a boat cruise, sandboarding, swimming, segways and a self-drive buggy—what more could you want in a day? The Story Bridge Adventure Climb is not for the faint hearted, but it offers panoramic views of Brisbane along with an adrenaline hit. And you have no choice but to leave your phone at home so you’ll get that break from social media you’ve been craving! We might not be able to have invisibility cloaks but we can have invisible kayaks. Sunset Safaris on Moreton Island, AKA a big kid’s playground, offers transparent day and night time kayaking experiences where you’ll get to explore the Tangalooma Shipwrecks as well as spot fish, turtles and dolphins. The night time experience is particularly amazing, as the shipwrecks are lit by LEDs and you’ll float among the rays and wobbegongs. Explore Brisbane on foot as you hunt for treasure Amazing Race-style with Breakout Brisbane. Choose from challenges in the CBD and Botanic Gardens; CBD, South Bank and Kangaroo Point; and CBD and Roma Street Parkland, and then select your team wisely! Escape rooms are all the rage right now and we’ve got two killer spots in Brisbane for you to check out. There’s Puzzled in Holland Park West which offers rooms like Puzzle Tech Murder and Haunted Academy and Escape Manor in the city which has got spooky rooms like The Asylum where you have to escape the clutches of a mad scientist. We’ve all dreamed of getting around on Marty McFly’s hoverboard, but now we don’t have to thanks to Jetpack Adventures. Don your jetpack or hop on a jetboard and let the high pressured water jets take you skyward above the broadwater. It requires a little bit of coordination but is a whole lot of fun! If you’re the kind of big kid that likes to get their hands/feet/everything dirty, a Noosa Quad Bike Tour is for you. Enjoy the drive out to Woondum National Park, hop on your own quad bike and then spend half a day driving through mud, dirt and creeks, with the chance to clean yourself up in some rock pools. Yeah, you could go to the snow, but why would you when you can ski on water on a 30-degree day? Oz Ski Resort is a world-class facility where you can learn to waterski like a pro in a man made freshwater lake in Coolum—sounds right up just about anyone’s alley. Just ten minutes from Noosa awaits a horse-riding experience to rival your childhood dreams of joining The Saddle Club. Noosa Horse Riding will lead you around Lake Weyba among the birds, kangaroos, goannas and stingrays on your very own stallion. Gardeners Falls in Maleny (AKA the Sunshine Coast’s hidden wonderland) is one of the best spots to visit on a weekend drive. Follow Obi Obi Creek downstream to Gardners Falls and do your best Tarzan impression as you swing on a rope into the rock pool below. Life doesn’t get much more blissful than this! Editor’s note: This article is proudly sponsored by Ford and endorsed by The Urban List. Thank you for supporting the sponsors who make The Urban List possible. Click here for more information on our editorial policy.